Find New York Babymoons and Romantic Getaways, from NYC to Charming Upstate Locations! New York babymoons offer the best of both worlds from the hustle and bustle of the city to tranquil settings of lakes, mountains and shorelines. Wonderful New York romantic getaways can be found throughout the state at mountain resorts, charming bed and breakfasts, boutique hotels and large city hotels. 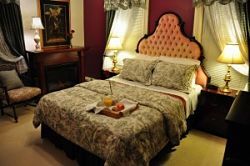 Escape to romance and Babymoon Bliss at 10 Fitch Luxurious Romantic Inn in New York State's breathtaking Finger Lakes region. Located on a quiet residential street in Auburn, NY, 10 Fitch is known as a romantic escape exclusively for adults, and is the perfect place to enjoy special time together before your little one arrives. Make your escape to 10 Fitch and bask in the bliss of each others undivided attention in a luxurious, private, quiet and romantic setting. Should you decide to venture out and explore the surrounding area, there is much to see and do - shopping, antiquing, museums, historic sites, entertainment, special events, restaurants, and of course many opportunities to enjoy the abundant natural beauty, lakes, waterfalls and rolling hills. Two 10 Fitch mugs for mom and dad, each filled with a special gift to remember your stay. *Room cost and taxes are in addition to the package price. Rest and renew at this national Historic Landmark resort in the spectacular Hudson Valley, just 90 minutes north of NYC. Tour the resort's award-winning gardens or explore nature on over 85 miles of hiking trails. The magnificent 30,000-square-foot Spa wing at Mohonk Mountain House features 16 treatment rooms, a solarium, an outdoor heated mineral pool, along with an indoor heated swimming pool with an underwater sound system, comprehensive fitness center, and yoga/motion studio. The spa offers stunning views of the natural surroundings. Athough Mohonk no longer offers a traditional babymoon package, you can create your own by adding some relaxing spa treatments to your overnight stay. Enjoy a 50 minute maternity massage that will leave you feeling totally nurtured. For the ultimate in together-time, relax side-by-side with the Hello Baby spa package featuring a 50 minute maternity massage for Mom-to-be and a 50 minute Eagle Cliff deep tissue massage for Dad. A stay at Mohonk Mountain House features charming accommodations, three meals daily prepared by award-winning chefs, afternoon tea and cookies, and most resort activities. Read a review of Mohonk Moutain House on Babymoonguide. The American Historic Inns "2009 Top 10 Most Romantic Inns" of North America was just one of the awards received by the beautifully furnished Edward Harris House. Your choice of: hand dipped chocolate covered strawberries, chocolate truffles or a late night delivery of pickles and Ice Cream! A massage can also be arranged upon request - just contact the Inn for prices. Why not create your own New York City babymoon package? There is so much to see and do in this vibrant city - take a romantic carriage ride through Central Park, indulge in a couples spa treatment, enjoy a romantic dinner for two or take in a Broadway show. You will definitely run out of time before you run out of options in NYC! 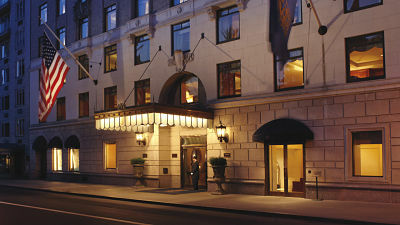 An oasis of luxury, elegance and calm in bustling Manhattan, the Hotel Elysée is located just steps from some of the city's best shopping and finest restaurants. This luxurious hotel was built in the 1920s and offers unrivaled personal service. The Elysée Romance Package is the ultimate way to escape and makes an ideal babymoon for parents-to-be looking for a romantic getaway! Enjoy the stunning scenery of upstate New York whilst you relax in style at Mariaville Lake, a 5 guestroom lakeside B&B in Mariaville. From the immaculately furnished rooms to the glassed in porch that allows you to take in the beauty of the lake and sky whatever the weather, the innkeepers go out of their way to ensure that your stay is both delightful and unforgettable. 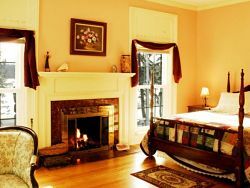 Rosehaven Inn is a beautiful Hunter Mountain bed and breakfast that just exudes Victorian charm! Located at the head of the famous Kaaterskill Clove, this delightful inn serves breakfast described as "scrumptious", with the menu featuring treats such as fresh fruit, savory egg dishes, French toast and pancakes. 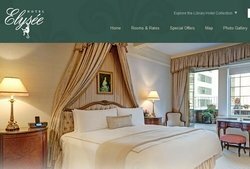 There are just 4 gorgeously decorated rooms, each designed with luxury and comfort in mind. If you're looking for a truly special Long Island babymoon, then take a look at all that Arbour View House has to offer! This beautiful Inn exemplifies the very best of Victorian architecture, which lends to its warmly romantic ambience. Rooms are luxurious, bright and airy - beautifully and individually furnished, with fresh plush towels every day, fluffy robes and slippers, and Sealy Posturepedic mattresses - just what you need for a restful night's sleep whatever your stage of pregnancy. 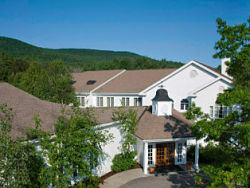 Just minutes from Gore Mountain and lake George sits The Copperfield, a luxurious Adirondack lodging resort with superior accommodations, swimming pool, two highly acclaimed restaurants and spa. Local attractions include museums and galleries, plus - for the dad-to-be - there are exciting water sports and even a zipline in spring/summer. In the winter, the mom-to-be can enjoy a relaxing spa treatment whilst dad hits the ski slopes or enjoys a spot of snowmobiling. Alternatively, you can simply snuggle together in your comfortable room and enjoy some peaceful quality time, for just the two of you. The Copperfield is unique in offering a "Build Your Own Package" option, allowing you to 'tailor make' your babymoon to suit your specific needs. You simply choose from a list of activities and amenities and the Innkeepers will put together a package just for you, for the dates of your choice. The Blue Heron Inn is situated in the hills of Chautauqua County and checks every box as the ideal babymoon destination! 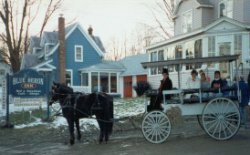 Its antique appointed accommodations are romantic and comfortable and its picturesque setting on Findlay Lake's north shore is the perfect place to 'get away from it all' with your partner. Local attractions include the eclectic 'Nostalgia at the Blue Heron Inn' store, which is famous for its artisan-crafted jewelry, hand-batik clothing from all over the world and... just what every mom-to-be needs... an old-fashioned candy counter! Enhance your babymoon experience by enjoying the five miles around the lake by boat, or even by taking a magical hot air balloon ride. Then enjoy a stroll around the local antique shops, farm markets and galleries. for relaxing pregnancy massage and prenatal spa treatment options.